Can I play the Hoosier Lottery online? The Hoosier Lottery is exclusive to Indiana but attracts considerable international interest due to its frequency of drawings, generous jackpots and better-than-normal odds. This simple five-ball game produces a new winner twice a week with jackpots never worth less than $1,000,000 and sometimes growing to be worth upwards of $50,000,000. Indiana does not sell Hoosier lottery tickets online, but WinTrillions.com can send someone to buy tickets on your behalf for a small commission. Pay for your tickets online and then someone will go buy the ticket and scan a copy for your records. Any amount you win (whether it be the big jackpot or a free ticket) will either be credited to your online account or they will arrange to have you collect your payments from Indiana if you hit a big one. To summarize, yes you can buy Hoosier lotto tickets online. They may not come straight from the source, but the top lottery sites do have a track record for safety and prompt payments. Get your tickets at WinTrillions.com and you’ll be in good hands. The Hoosier lottery costs $1 per play with drawings held every Wednesday and Saturday evening. When you buy a ticket, you are asked to pick six numbers from 1-48 and then win the whole jackpot if you match all five numbers. There are also four other winning combinations with prizes that range from a free ticket to a share of the total prize pool not counting the main jackpot. People tend to like this particular lottery because it is easier to win than other similarly-sized jackpots. You only have to select from 48 numbers in this one rather than the standard 59 or 60 like you see in other state lotteries. Thus, the odds of hitting the jackpot in this one are 1:12,271,512. This is quite a step up when you compare it to the NY Lotto which has odds of 1:22,500,000. Some people even seem to like it too much. A while back, three people found themselves in hot water after trying to game the system. A family hit the big one for $2 million and all seemed well until investigators learned the winning entry came from a roll of tickets that the family was never authorized to activate after they sold their liquor store. You can play the Hoosier Lotto any time and take some satisfaction knowing your money supports a good cause. Revenue collected by the state is put towards local police and firefighter pensions, the teacher’s retirement fund and the Build Indiana Fund. Even when you don’t hit the big one, at least you know you’re doing some good for the state. Since its inception in 1989, the Hoosier lottery has transferred more than $4.3 billion to various state funds and paid more than $9.4 billion in winnings to players. You can read more about where the money goes at the official Hoosier lottery website. In addition to scratch tickets, players in the Hoosier Lottery can participate in nine draw games that can result in mega winnings. The three most popular jackpot games are Powerball with Power Play, Mega Millions with Megaplier, and Hoosier Lotto. Resident of Indiana will be excited to know that their state has sold more winning jackpot tickets than any other participating jurisdiction. The EZmatch add-on is an optional feature that you can add to any ticket for an extra $1. 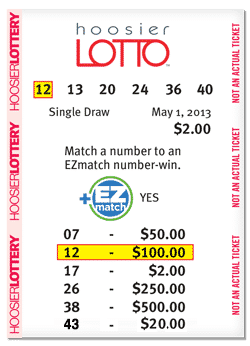 Then, you win an additional prize if any of your numbers match the five additional EZmatch numbers printed on the ticket. Prizes range from $2 to $500 depending on which number matches. Can I buy Hoosier Lotto subscriptions online? Yes. Again, the Hoosier lottery does not sell anything online but you can use any major lottery site to purchase subscriptions. My top pick once again is WinTrillions.com with one-month subscriptions for 12 consecutive draws starting at $37. You can move up from there to year-long subscriptions for 104 consecutive draws starting at $277. An online subscription to the Hoosier Lotto gives you the choice of selecting your own numbers or letting the number picker do it for you. In either case, your lottery website will then automatically purchase tickets every week and notify you of all winners big and small. Regular subscriptions are no problem, but I have been unable to find any lottery sites that manage syndicates for the Hoosier lottery. For those who don’t know, a syndicate is basically just an arrangement in which you and a group of other people all team up, put your money together, buy a bunch of tickets and then split any winnings equally among everyone. Lottery websites do offer syndicates for bigger lotteries (such as Powerball) but state lotteries don’t normally get the syndicate treatment.